built for power and speed. Apollo is built by a former Apple employee with feedback from thousands of Redditors to sculpt the best client possible. It features a beautiful, native iOS design, smooth, customizable gestures, fast loading pages, a supercharged Media Viewer experience, a powerful, full Markdown editor, a Jump Bar for lightning-fast navigation, and so much more. You have to see it to believe it. Apollo was built from the beginning to look and feel like a gorgeous, immediately familiar iOS app, following the design guidelines Apple put forward. 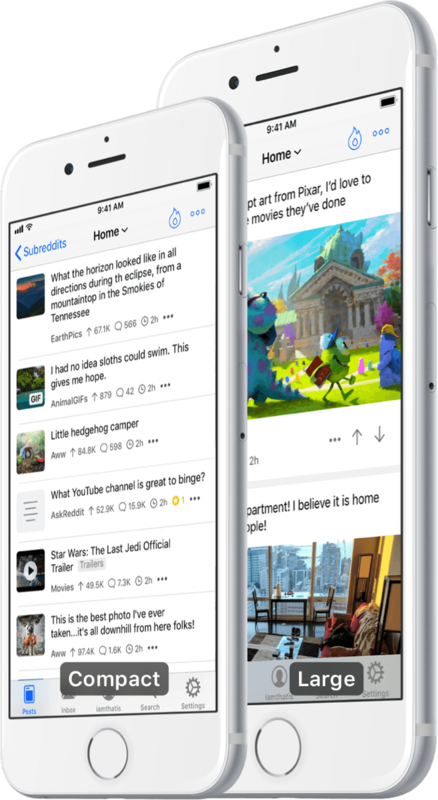 Essentially, the goal was to envision what a Reddit app would look like if Apple themselves built it. The design was meticulously sculpted and refined over years, always making sure the UI felt comfortable and distinctly iOS, and with all the power, speed and flexibility you could possibly want. Viewing media is at the heart of what makes Reddit so awesome, so you need a Media Viewer that's absolutely top notch. 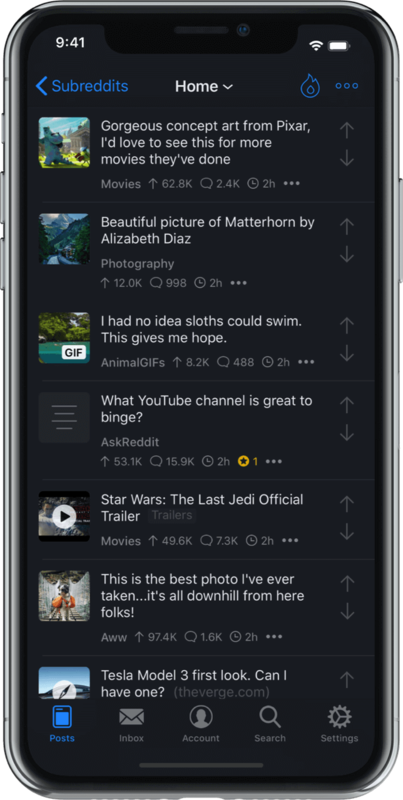 With Apollo, you can view tons of content from numerous sources such as Imgur, Reddit, Gfycat, Imgflip, XKCD, Streamable, YouTube, Vimeo, and more. View images, albums, HTML5 GIFs (with time-scrubbing), videos and more in an incredible, content-first media experience. Reading fascinating conversations in the comments of Reddit threads is where a lot of us spend most of our time on Reddit, so it has to be a fundamentally incredible experience. With awesome inline previews of links in comments, customizable gestures with swipe to collapse, full spoiler support, and tons of more options available via long-press, Apollo offers the best comment browsing experience in town. Reddit takes full advantage of Markdown, a really effortless way to format text with bold, italics, links, and much more. On mobile, it's never been easy to take advantage of these formatting features, but with Apollo you can let its Markdown editor do all the formatting and previewing for you so you can just focus on writing. Easy inline image and album uploads, too! Navigating between subreddits is one of the most common things done on Reddit, so it has to be a smooth, effortless experience. Enter the Jump Bar. Lightning-fast subreddit autocomplete lets you quickly bounce between numerous subreddits with just a few letters entered, or Favorite a subreddit and have it available in just a single tap. In addition to the gorgeous Light Mode, Apollo also has an incredible Dark Mode that's great when you want something easier on your eyes at night, or you just prefer Dark Modes! In addition to being able to long-press the navigation bar to toggle it, there's also an option to have it come on automatically based on screen brightness or local sunset times. Enjoy Apollo not only on your iPhone, but also on your iPad! 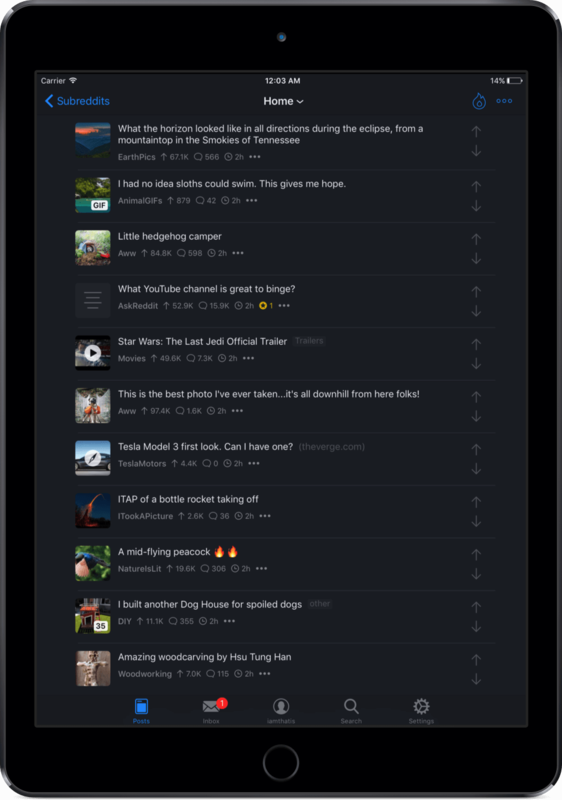 Apollo on iPad is very much a work in progress, with some phenomenal updates planned to really bring it to the next level of iPad Reddit apps and show exactly what the iPad has to offer as an incredible computing device.